First, let’s explore what the Bermad IR-100 Series in general can offer in terms of irrigation system performance, ease of maintenance, and ROI. Then, we’ll take a closer look specifically at the IR-100 DC double chambered model, including the variety of benefits and optional applications obtainable through their use. 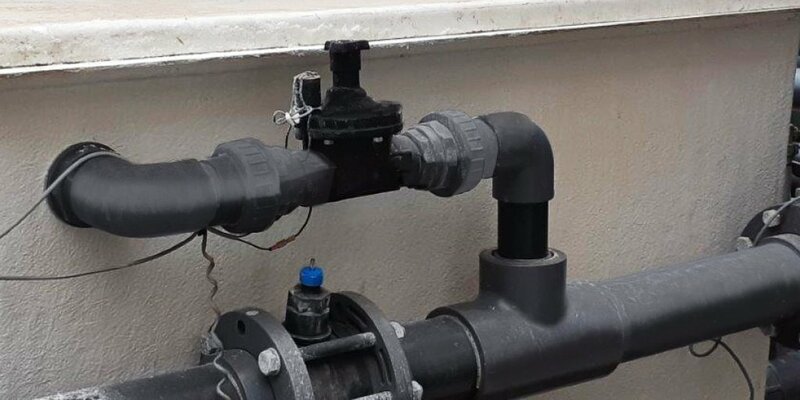 Why Use Plastic Irrigation Control Valves? Cost efficiency - Quite simply, plastic cost less than metal, both in terms of raw material and the manufacturing process. Plastic is cost effective to transport as well, since it is lighter in weight. Easy installation & maintenance - Plastic’s lighter weight makes it easier to handle during installation and maintenance. On a large project, this can help to minimize installation time and required personnel. Chemical resistance - Bermad IR-100 Plastic Series is made of composite polymer providing very high resistance when exposed to chemicals high saline or acidic water. This can greatly extend valve durability in irrigation systems that frequently apply fertigation and chemigation. Cavitation resistance - Cavitation occurs in hydraulic system components depending on conditions such as flow velocity, differential pressure, absolute pressure and water temperature. The composite polymer lends an elastic property to the valve body, so it can better absorb jets and vibration providing high resistant to cavitation damage. Why Use the IR-100 hYflow Series? 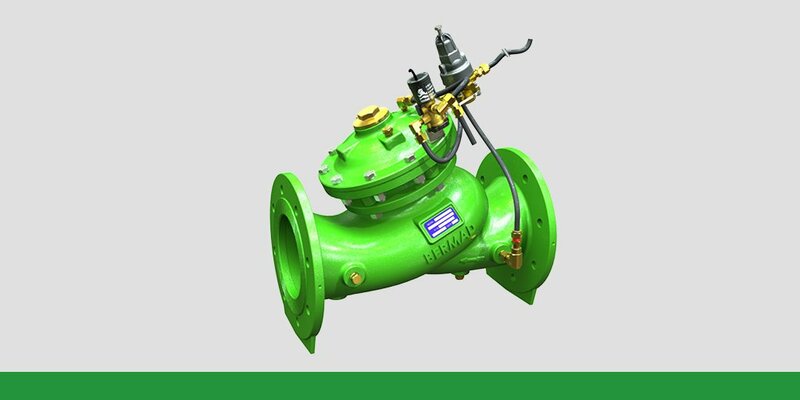 In addition to all the advantages of a plastic valve, Bermad IR-100 series control valves offer number of other important attributes derived from the valve’s special "Y flow" body and look-through design. The IR-100 Series are hydraulically operated, diaphragm actuated control valves. Flow through the valve is considered to be relatively laminar. These valves are characterized with stable performance at a wide range of flows and working pressure. IR-100 Series valves are typically characterized with restrained opening and closure process. Why Use Bermad’s IR-100-DC Double Chambered Valves? Standard single chamber valve actuation is derived from differential pressure across the valve, which means that a closing spring is required and that the valve diaphragm is exposed to downstream flow. In a double chambered valve IR-100-DC, uniquely developed by Bermad, the underside of the diaphragm is exposed to the atmosphere, isolating the lower part of the diaphragm from the downstream pressure. Therefore this valve offers excellent closing force. Each double chambered valve contains two major components: the actuator assembly and the body. The actuator consists of an upper and lower chamber and can be removed from the body as an integral unit. Isolated and protected diaphragm – The inherent separation partition that actually creates the lower control chamber also separate it from the dynamic flow both in the single chambered and in the double chambered configurations. In the single chamber configuration the separation partition provides mechanical protection to the diaphragm. In the double chamber configuration the separation partition protect the diaphragm mechanically and hydraulically. This protection lowers the risk for diaphragm wearing & distortion by particles that exist in the water. Opening at exceptionally low pressure- Exposing the lower chamber to the atmosphere eliminates the need for a spring to act as a driving force for closure. Therefore the required line pressure for opening the valve is lower than the line pressure needed for opening a single chambered valve. Lower head loss - The fact that closing spring is not required, minimize the head loss across the double chamber valve compare to a single chamber valve. Double chamber valve combined with 3-Way controls will react faster than a single chamber valve, even in case of full opening of the valve. Therefore by combining 3-Way controls and double chamber valve one can benefit twice: lower head loss and faster valve reaction time. Higher tolerance for water quality – The ideal combination of double chambered valve with 3-Way controls result in a valve which is less sensitive to poor water quality. That is because the diaphragm is protected from particles in the water and because the 3-Way controls requires less water for control. Immediate valve response – Looking on the hydraulic forces inside the double chamber valve, we can understand that there is equilibrium of forces acting on the seal area and there is no opening hydraulic force acting on the lower control chamber, so ultimately the only active hydraulic force is applied as closing force on the upper control chamber of the valve. That is different from a single chambered valve and makes the valve closing response immediate. Excellent closing mechanism – The IR-100-DC valves offer smooth and responsive closing performance in compare to single chambered valves. At the end of the closing process, the valve lands smoothly on the seat, ensuring safe, surge-free closing. 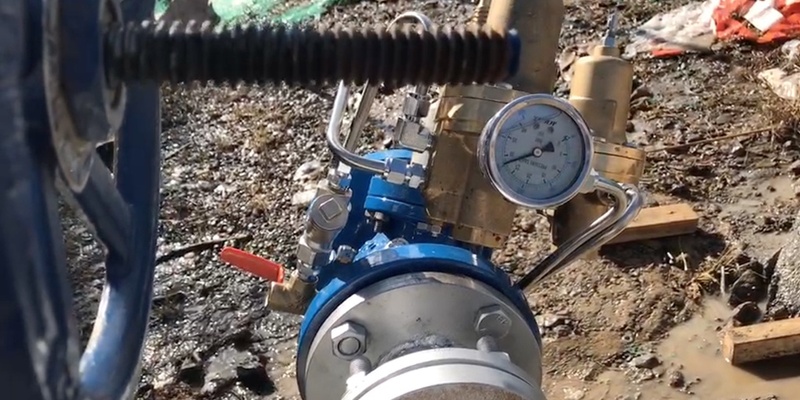 If applying external control pressure (for example in the application of remote irrigation valves), the control pressure can be 20% lower than the line pressure. Fail safe open or close valve. Check valve or drain valve – by adding a spring to one of the control chambers. The double chamber actuator can be easily converted to single chamber by externally connecting the lower chamber to the downstream using a control tube. If there is a single chambered valve at site, it is very easy to replace it with a double chambered valve. Please see the link below. As double chamber valve lower chamber is isolated from the downstream pressure, in case of back flow condition no opening force acts on the diaphragm. Therefore the valve operates as a mechanical check valve, by nature (addition of a closing spring will be required). When double chamber valve upper control chamber is connected to the downstream pressure, the valve will operate as a proportional reducing valve. The downstream pressure is applied as the closing force on the top side of both the diaphragm and the seal disk areas. The upstream pressure is applied as the opening force on the bottom side of the seal disk area. The net force, resulting from the two opposing dynamic forces acting on the actuator's diaphragm and seal, determines the degree to which the valve is open. The valve seeks the point where these forces are equal. As the ratio of the areas of the seal disk and the diaphragm is constant, the ratio of the upstream and downstream pressures is constant as well. A rise in downstream pressure causes a momentary increase of the closing force. As a result, the valve throttles closed reducing downstream pressure according to the constant ratio. surge-free closing of the valve. 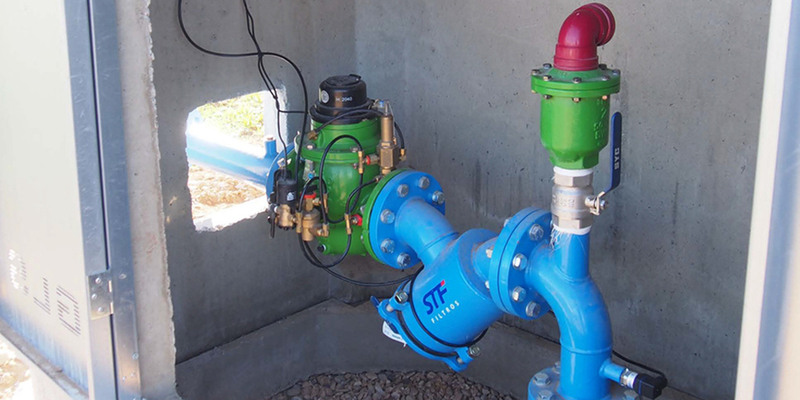 A double chambered, hydraulically operated, diaphragm actuated control valve suitable for automatic flushing of distribution lines at the beginning and the end of each irrigation cycle. Equipped with an auxiliary opening spring and a flow stem, it enables automatic opening when the system reaches closure pressure and settable opening rate, ensuring line pressure build-up for secure closing.